The Velociraptor was a dinosaur that lived about 75 million years ago during the end of the Cretaceous Period. It is most famous for its role in the movie Jurassic Park. However, in the movie it is shown to be much larger than the actual dinosaur was. The Velociraptor was discovered in 1924 by paleontologist H. F. Osborn. What did the Velociraptor look like? The Velociraptor was a fairly small dinosaur. It was around 6 feet long from the tip of its tail to its nose and was around 3 feet tall. It weighed around 30 pounds. This dinosaur walked on two feet (bipedal) and could run very fast, perhaps up to 40 miles per hour. It had 80 very sharp teeth and sharp claws on its feet and hands. One of its claws on its feet was especially long and dangerous. This middle claw was up to 3 inches long and likely was used to tear into prey and deliver the killing blow. The Velociraptor had one of the largest brains when compared to its size of any of the dinosaurs. It was likely one of the most intelligent dinosaurs. Velociraptors were carnivorous, meaning they ate meat. They likely ate other plant eating dinosaurs and may have hunted in packs in order to bring down larger prey. One of the most famous fossils discovered involves a Velociraptor fighting a Protoceratops, which is a smaller plant eating dinosaur about the size of a large sheep. The Velociraptor lived in a desert like environment. Fossil specimens have been found in northern China and Mongolia in the Gobi desert. 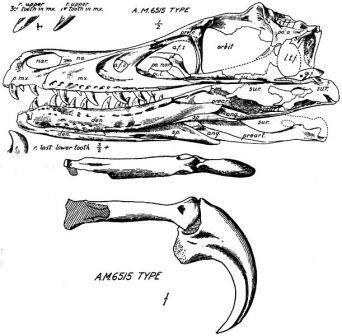 The first Velociraptor fossil was found in 1923 by Peter Kaisen in the Gobi desert. Henry Field Osborne named the dinosaur. It is part of the dinosaur family Dromaeosauridae. It had hollow bones like a bird, making it fast and lightweight. Scientists think that the Velociraptor was covered in feathers. The version shown in the movie Jurassic Park is not only too big, but they changed the shape of the snout, the arms, and left off the feathers. Were they super smart, as depicted in the movies? Scientists have no way of knowing, but they do think that dinosaurs in general weren't that smart. The Velociraptor is the mascot for the NBA team the Toronto Raptors. The name Velociraptor comes from two Latin words meaning speed and robber. Apatosaurus (Brontosaurus) - Giant plant eater. Stegosaurus - Dinosaur with cool plates on its back. Tyrannosaurus Rex - All sorts of info on the Tyrannosaurus Rex. Triceratops - Learn about the giant skulled three horned dinosaur. Velociraptor - Birdlike dinosaur that hunted in packs.